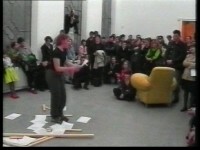 In 2000 Kajsa Dahlberg gave a performance at Kunstverein Hannover. With the point of departure in the measurements of the Swedish kitchen standard she conjured up the image of a Swedish standard kitchen. Every distance, every height and width were represented by a stick of the exact measurement. The artist worked through the fictitious kitchen, measurement by measurement. These measurements are based on research into the ideal working process, with the aim of minimising unnecessary movements in the kitchen. Thus, the sink should be located next to the cooker; cupboards for crockery and glass next to the draining board, etc. There should be a specific distance around the dining-table so that the family can enjoy their meal without feeling cramped. The worktop and cupboards should have certain measurements in order to maximise the efficiency of the working process. When this research was initiated in the 1930s, most kitchens were still hopelessly impractical and housewives took many unnecessary steps in their work places. Modernising the home and making it more efficient was one of the main tasks of the Swedish Folkhemmet programme. [“people’s home” – the Social-democratic idea that the nation should be like a “home” to all citizens]. Educational and instruction films, such as the housewives films that were produced into the 1970s, were a tool in this process. Today, most kitchens are still based on these principles and we no longer think about it. If we are to design our own kitchen, these are the patterns we choose from. Through the means of IKEA, the Swedish kitchen has been introduced internationally. Kajsa Dahlberg’s work Kitchen, as well as the Swedish housewives films, demonstrate how the concept of work is connected to the defining of the space and the world around. Planned, and eventually habitual body movements and thought patterns govern our relationship to our surroundings, and create meaning and structure. A similar meaning-creating act is carried out in the artistic work. 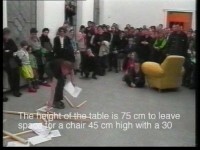 However, while the Swedish kitchen standard, despite the best of intentions, turned into a limiting structure that defined the woman’s place to the kitchen, the artist makes visible these structures – redefines them and transforms the kitchen into a place for artistic action – a questioning of something which is, after all, a fictitious structure. 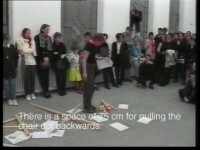 The performance starts and ends with a pile of sticks thrown on the floor.